Blank Greeting Cards Designed by Tropical Artists. The inside of these blank greeting cards leaves plenty of space for your personal message. They have all been developed by greeting card designers, who are experienced artists, living in the tropics of North Queensland, Australia. They reflect the painting or printmaking style of each artist and, in some cases, are small reproductions of existing paintings. Printed on good quality card, most designs have a gloss finish and come with an envelope and plastic bag. These artistic greeting cards may be purchased, in multiples, direct from this site, with postal charges being kept to a minimum within Australia. Multiples may be ordered in the same design or a ‘mix ‘n match’ arrangement may be preferred. Some artists also offer postcards, so that you can easily keep in touch with friends and loved ones, whether you are on holidays or not. 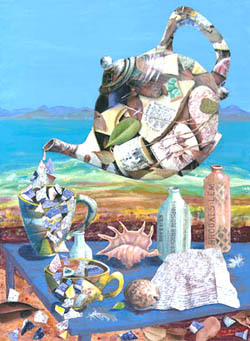 'The Blue Table', from a painting of the same name, tells a story about pioneering women of North Queensland. These women helped their Low Isles lighthouse-keeper husbands keep the beacon of light burning for seafarers threading their way through the hazardous Great Barrier Reef. The women were far from 'home', which was often England or Scotland, their only connection with their families an occasional letter, which reached them after a long sea journey. So I imagine that their reminiscences, as they read these letters over a comforting cup of tea, would have been a mixture of joy at news from afar and of regret at being so far away from them. More greetings cards by Jill Booth on this page.